If you Google the definition of ART, this is what pops up in the number one spot. When I think of art I think of the individuality that abounds in every piece. 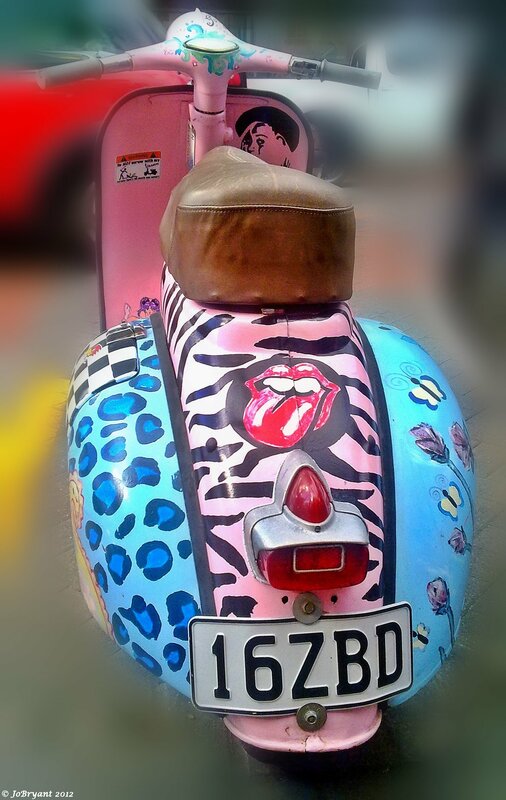 Just like the individuality that was evident in this glorious example I found wandering the streets of Tauranga one day. Ailsa over at Where’s my backpack thought up this great theme this week. Head over to her blog and check out the other interpretations of ART. And seeing as it fits with the Fleeting Moments street photography theme…I’m popping it in there too !!! Next postThe Bellman Chronicles: My first author interview !!!! Love the non-matching rear…fenders? Wheel covers? Those blue things covered with patterns, anyhow. I loved that wee scooter when I saw it…reminded me of a friend’s tractor I once helped do similar things to. Yep !!! I thought it a wonderful example. Quite the Kiwi way really. Thanks. I was blown away when I saw it…fell instantly in love. Would love to do something similar myself. Oh yes please post it !!! Hmmmmmm…finding the right vehicle may take a while. COOL! I love this kind of art. I’m glad you found this and shared in Travel Theme challenge. Way to go. So glad you like it…it was love at first sight for me. Oh my…I never thought of it for the ‘fleeting moment’, but you’re right !!!! Awwwwww…thanks. I was so pleased it turned out. Can relate to that! When I discovered my water lily had a bud there was a droplet of dew sliding off the tip of a leaf nearby and was amazed that I managed to capture it! Thanks…I thought it was amazing. I want one !!!! Great minds and all that jazz !!!!!!!!!!! Thanks Jake…it sure caught my eyes. What a fun scooter. It must cause a lot of people to smile, which is always a good thing. 😉 Great entry, Jo. It does look fun !!! And smiling is always good…so a two for one deal I think. I thought so Madhu…glad to hear you do too !!!!! You certainly wouldn’t lose it, would you , Jo? It’s very outstanding! Nope…no fear of misplacing THAT scooter Tom !! Thanks Joshi…it is all that. Oh yes it is. I want one !!!! I get the impression you liked it! It was LOVE at first sight Isobel. Yep it is isn’t it !!!!!!!! Ah well spotted, it’s well cool, and do you have photos of the tractor you helped your friend do? Glad you think so Gilly !!! No – never thought to take one. Shame really. The wheels became flowers and we painted a face around the grill and lights. I really loved these. Bert and Ernie? Of course! Of course you do…what isn’t to love !!!! So true…it is reminiscent of that time. Wickedly painted!!! Yep that it is Androgoth…that it is. Great whimsical take on the challenge! So glad you think so. I have been waiting for a challenge where I could use them ever since the day I shot them..
Now, that is one cool, artistic , unique vehicle. As my son puts it, “It’s all about customizing dad!” know I know what he meant and it’s beautiful! I thought so when I saw it. Couldn’t wait to use the pics !!! Clever son that lad of yours. 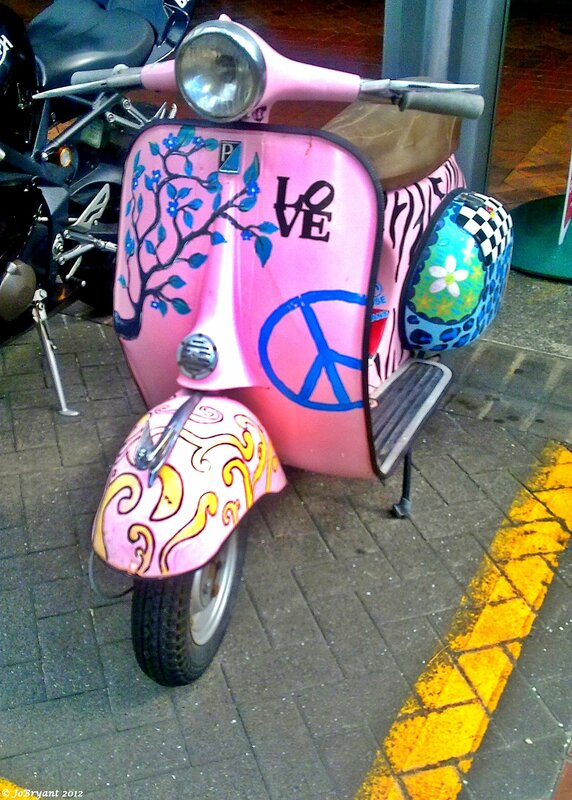 Colorful Vespa. 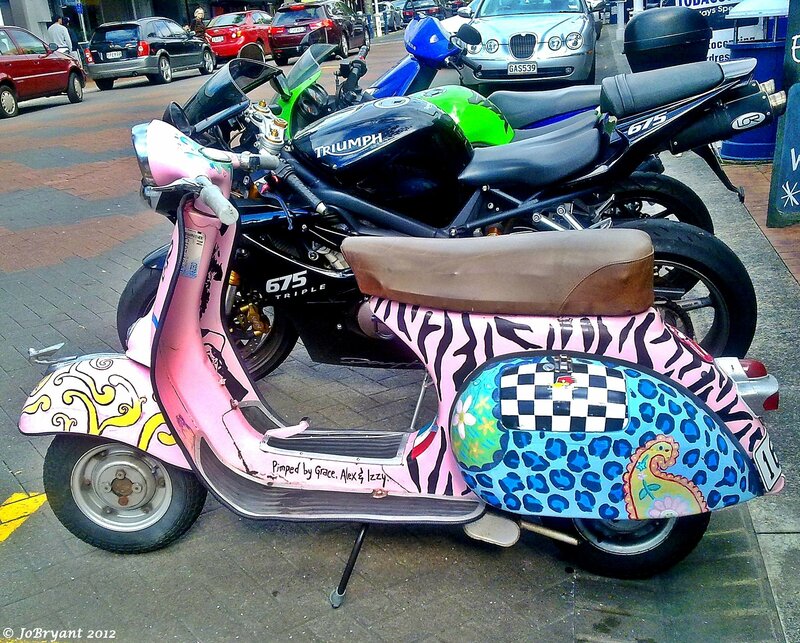 There’s a blog on WordPress that’s focusing on Vespa’s, I’ll tip her about your post. Oh that would be cool !!! I would love to check out her blog. 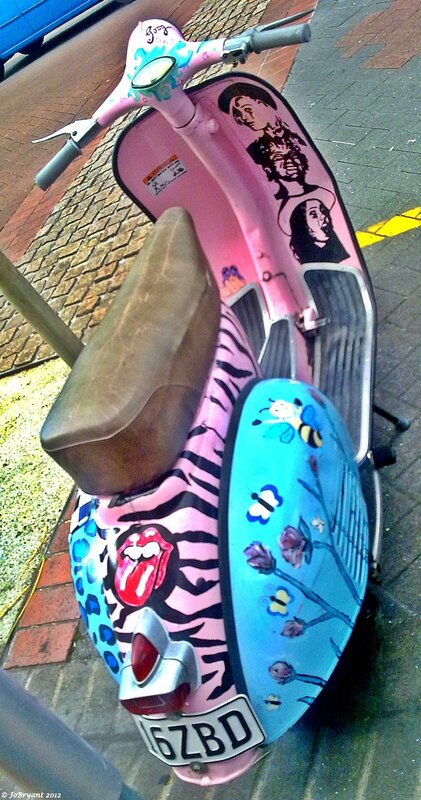 I think I am officailly a Vespa fan for life now. Oh you are just too good to me. I may be a manly Pirate, but I would be proud to ride that steed around the docks. Are you insinuating this may not be considered a manly vehicle ???? Not been very well…the flu and its aftermath have taken their toll.